This free event will give residents the chance to meet the candidates who wish to represent them on Cobourg Council one last time and learn how each candidate will address the three pillars of sustainability (economic, environmental, social). 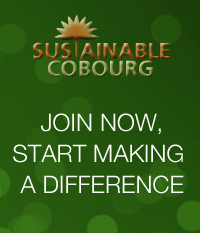 “Choosing a Council that makes decisions beyond a four year horizon, one that understands the ‘triple bottom line’ rather than just the economic one, and a Council that supports reducing GHG emissions with a Climate Action Plan, is a Council that can make a real difference to Cobourg and its residents” says Sustainable Cobourg President, Gigi Ludorf-Weaver. All 9 candidates for the position of Cobourg Councillor have confirmed their attendance, as well as both candidates for Deputy Mayor of Cobourg. No pre-registration is required. The venue is the lecture hall in the new Venture 13 Innovation Centre across from the CCC. Doors will open at 6:30 p.m. and the forum begins at 7:00 p.m. The event, moderated by Jayne Finn (V-P of Sustainable Cobourg), will provide each candidate the opportunity to share their views on topics related to the 3 pillars of sustainability (environmental, economic, social) through a set of prepared questions. Community members will also have the opportunity to submit their questions. Please submit your questions via email by October 10 to gludorfweaver@sustainablecobourg.ca. This entry was posted in Climate Change, Eco Action, Energy, Environment, Food & Organics, Health, News 2018, Political, Sustainable Planning, Transportation, Waste and tagged climate, climate change, Cobourg, development, election, emissions, Energy, environment, event, farmers, farmland, food, gas, green, greenhouse, Health, local, municipal, Northumberland, Ontario, planning, pollution, sustainability, sustainable, Transportation, Waste. Bookmark the permalink. Hi Catherine, excellent point! I have revised the post to include the date, which is Oct. 12. Thanks!